This section provides an overview of how DeepSee supports localization of strings. DeepSee provides a simple mechanism for localizing the names of level, measures, and other model elements. Specify a value for the displayName attribute for every DeepSee element. In the Architect, when you specify a name, the system initializes the Display name field with the same value. When you work in Studio, however, you must remember to specify the displayName attribute (which is optional), in addition to the name attribute (which is required). This global (which is known as the message dictionary for this namespace) contains the messages defined in this namespace; for DeepSee, each message corresponds to the name of a model element. 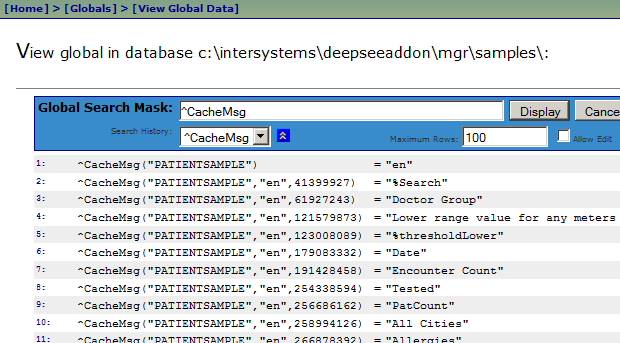 DeepSeeUser is the domain that DeepSee uses by default when it looks for a localized string in a dashboard. For details, see the following sections. When you compile this class, the compiler finds each instance of the $$$Text macro and adds values to the ^CacheMsg global in this namespace. If you do not include the /OtherDomain part, DeepSee looks for this string in the default domain. Change to the namespace in which you are using DeepSee. To generate a sample message file, use this command in the SAMPLES namespace. Optionally use the Management Portal to verify that the message dictionary has been updated. To do so, switch to the appropriate namespace, select System Explorer > Globals, and then click View Globals for the ^CacheMsg global.